JoRee LaFrance ’17, from Crow Agency, Montana, and Helen Thomas ’18, from Grand Forks, N.D., have been awarded 2016 scholarships from the Morris K. Udall and Stewart L. Udall Foundation. 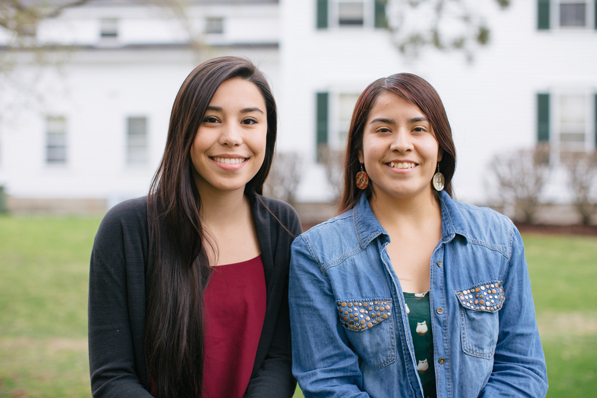 They join 58 other Udall Scholars—exceptional student leaders from 49 colleges and universities around the country who are committed to careers in the environment, American Indian health care, or tribal public policy. The scholarship provides up to $7,000 for the scholar’s junior or senior year. A double major in earth science and Native American studies with a minor in anthropology, LaFrance, a member of the Crow tribe, wants to learn more about tribal energy and economic policy. This summer, LaFrance will be in Washington, D.C., as Mickey Leland Energy Fellow, serving as an intern at the Department of Energy, where she will be researching tribal energy policies around coal. She has also received Stamps Leadership Scholar Award and a Dreamstarter grant from Running Strong for American Indian Youth, both of which she is using for a project to preserve her people’s oral traditions by connecting elders with students in schools on her reservation. Thomas, a Hunkpapa Lakota, plans to major in economics modified with education and minor in Native American studies. She wasn’t sure how she wanted to direct that passion until this winter, when she took a class called “Issues in Contemporary Education in America,” with Charles Wheelan ’88, a senior lecturer and policy fellow at the Nelson A. Rockefeller Center for Public Policy. “I realized how many issues there are in our public education system, and then how much worse those are on reservations,” Thomas says. Thomas plans to use the Udall Scholarship to study in Denmark next year through a Dartmouth exchange program with the University of Copenhagen. Thomas is active in Native Americans at Dartmouth (NAD). She served on the committee for last year’s Powwow and as NAD social chair, and this summer will serve on the group’s executive committee. In addition, she works for GreensCorps and the Upper Valley Business and Education Program, a local nonprofit organization. She has participated in the Management and Leadership Development Program through the Rockefeller Center. In August, the 2016 Udall Scholars will gather in Tucson, Ariz., to meet each other and program alumni as well as other leaders in public service. Both LaFrance and Thomas are excited about meeting their fellow scholars. LaFrance agrees. “Really getting to know people who can help me achieve what I want to do and building that network is an awesome opportunity,” she says. For information about applying for Udall Scholarships and other opportunities, visit Dartmouth’s National Scholarships/Fellowships website.